Thanks to Men's Fashion Week, I had a chance to meet Bryanboy. I've been reading his blog since the 'I'm so gay, I sweat glitter' period. I've always wanted to meet him in person. And finally, this day arrived. On top of that, he even tweeted me! I was so psyched when I ran into him. He was super nice, he said he loved my bag and shoes. For those who want to meet him, I recommend you to book the tickets to the last day of MFW, which is tomorrow. Try your best luck to snap a picture with him. OMG!! How lucky you areeeeeee! You both look so gorgeous! Hehe he's such a sweetheart. You're so luckyyy! Great picture, you both look gorgeous! he's so gorgeous!!! and you look awesome too with the dress and your Celine! 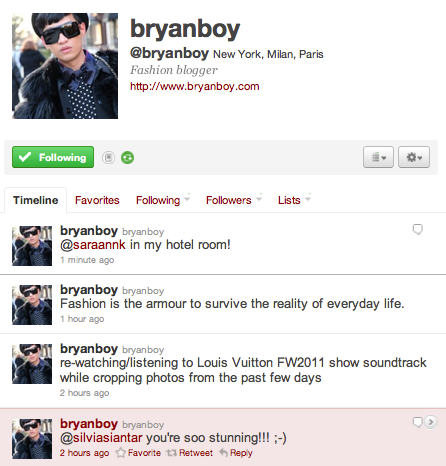 ur so lucky to meet with bryanboy! he's fabulous! How cool, i agree with what he said! and yes, u do look stunning as well. Wow wow wow! How lucky! My dress is from ASOS, hurry buy since it's still in stock now. hi, where did you get your belt from? it's gorgeous.